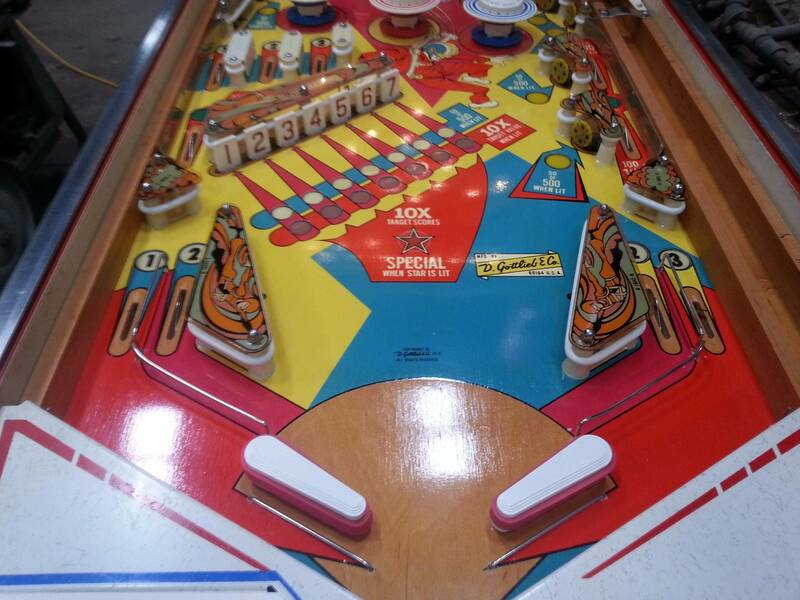 » Forum » Electro-Mechanical » EM Pinball Hangout » Nice Original Sky Jump BG Value? » Nice Original Sky Jump BG Value? 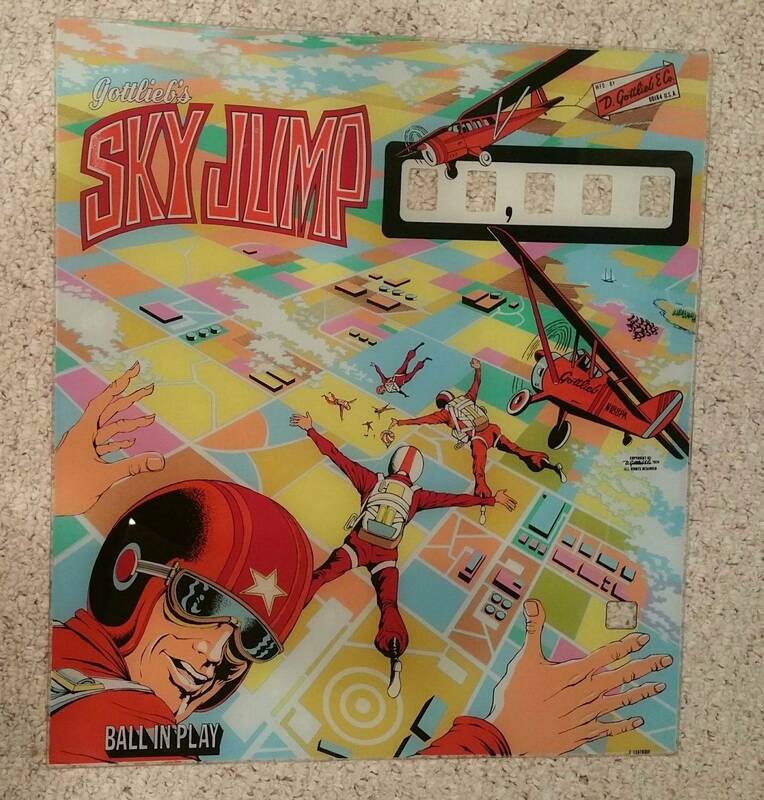 Nice Original Sky Jump BG Value? Anyhow, I have no idea what to sell it for - anyone have an idea of value? Mine is pretty nice too but has a little flaking in the title, may be interested. But probably above my budget! Hope you get a good sale with it. Sky Jump is a great game. 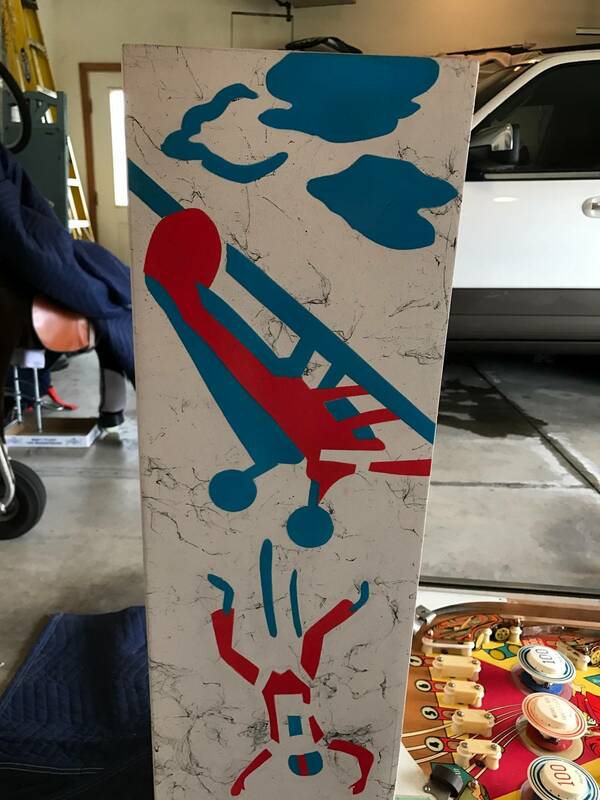 If you're in no hurry to sell it, I would price it in the same ballpark as Shay's repro. If it's truly exceptional, it will appeal to purist collectors. Maybe $250, depending on how nice it is. Cliff you want me to post a pic of front and back? I do believe I snapped a few. i could not find the ones i took when i had the glass removed. but these should show there was just a few tiny pin spots. unlike th average gllass the had hunks of paint missing in the name and guys head not to metion other places. Thanks for posting the pics Dave. Leckmeck you bring up a good point - appreciate the input. Now that I'm going to list it - I'll move this to the marketplace - thanks again. A glass that is already starting to flake in multiple places, pinholes or not greatly lowers the value unless you're talking about a one of a kind glass that isn't being reproduced anywhere. I would peg yours in the 100-125 range, but as always, the market will dictate the value. 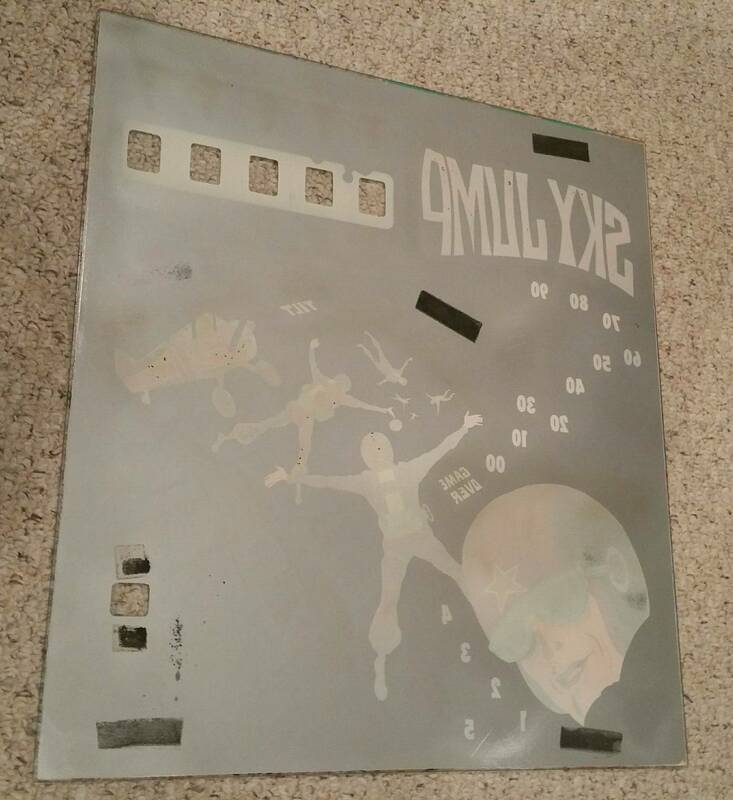 But enough about the backglass, I want to know what was done to the playfield to get that shine. Looks great! There's no flaking - look at the front of the glass to confirm. The white spot on the left dark area of his helmet is just a reflection. 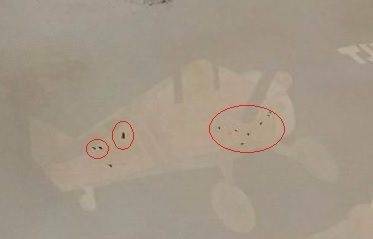 And those larger dark areas you see on the backside are just residue from pieces of foam tape the previous owner had on there. There are def several pinholes though. I would peg yours in the 100-125 range, but as always, the market will dictate the value. You can also see it in the lettering and other places. And the foam strips were installed at the factory. Like I said--flaking is minor (but not non-existent), and you still have a nice looking backglass--one of the nicer ones that I have seen. This falls under, "Wish I was Closer". Hyped to see a few are out there still. Glass shipping long distance is usually OK as long as it is packaged right. But for OCD me, it is the thought of the item travelling through below freezing temperatures, then back inside to a warm sorting plant, then back outside again. Does this cause flaking? I know the paint will flake from the BG lights if you turn it on in a cold room. 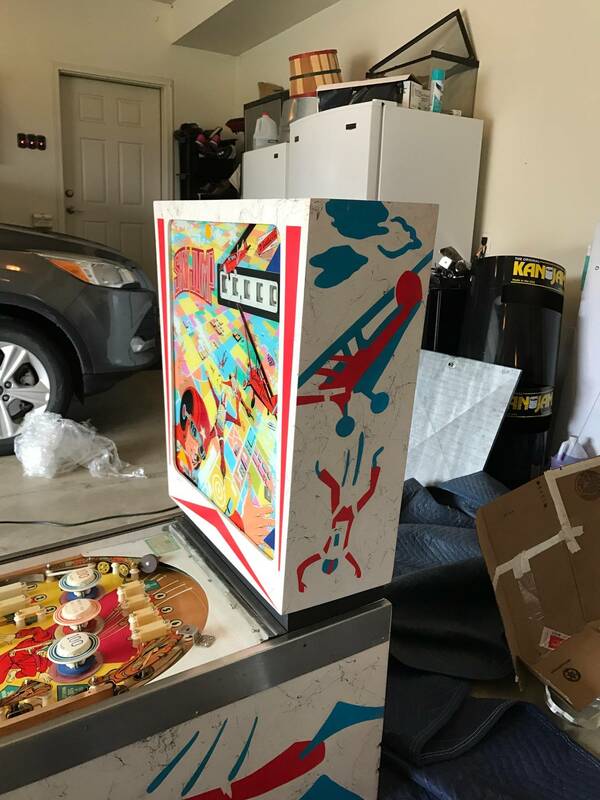 I have a newly painted ( March 2017) cabinet if anyone is interested.... comes with a project game and planked playfield! That cabinet looks nice . 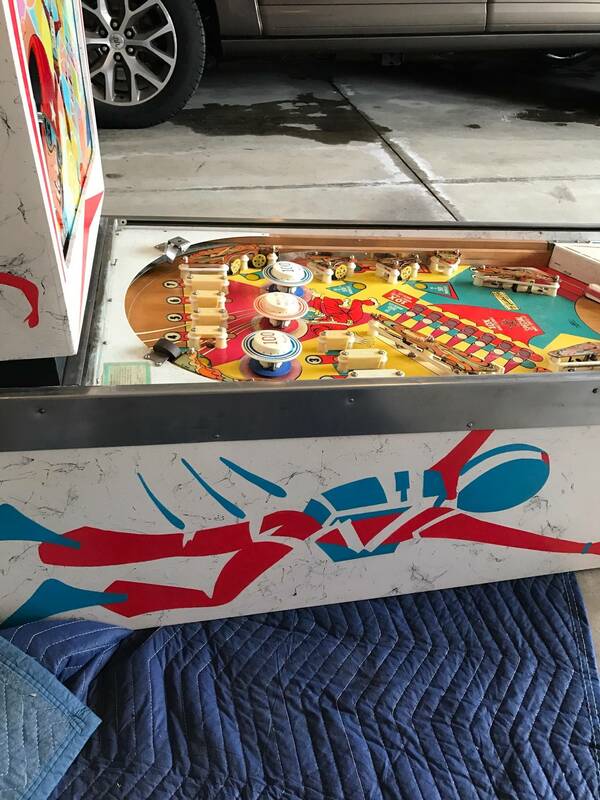 I have one of the nicest original cabinets I've ever seen. 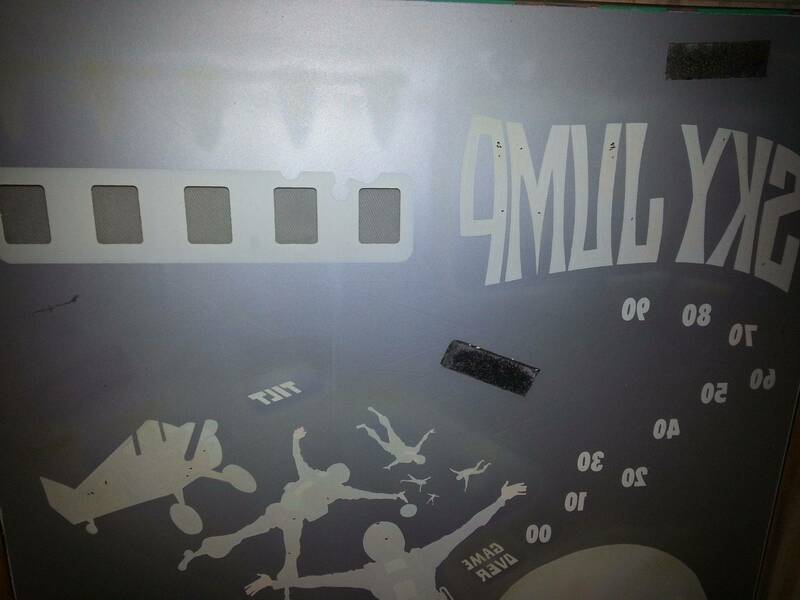 (Was on Free play in Allentown 2014) However the Factory paint for Skyjump and Free Fall is spatter not webbing . That's just my observation. Could of sworn my original SJ has webbing... Maybe not though. 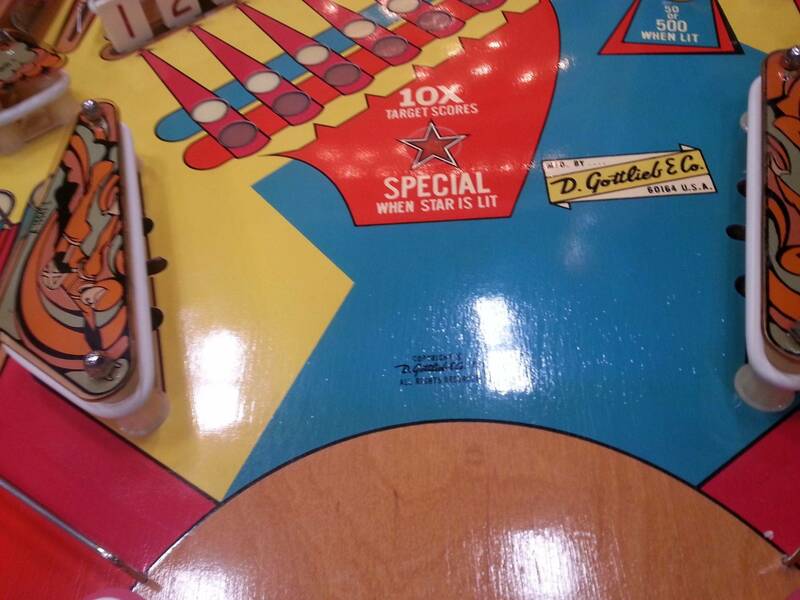 It obviously is in the "spatter time period" of Gottlieb games. i believe sky jump had webbing and free fall had splatter. it was the transition game. and the webbing on sky jump was pretty heavy. and that repaint looks to be spot on webbing wise. This is correct. 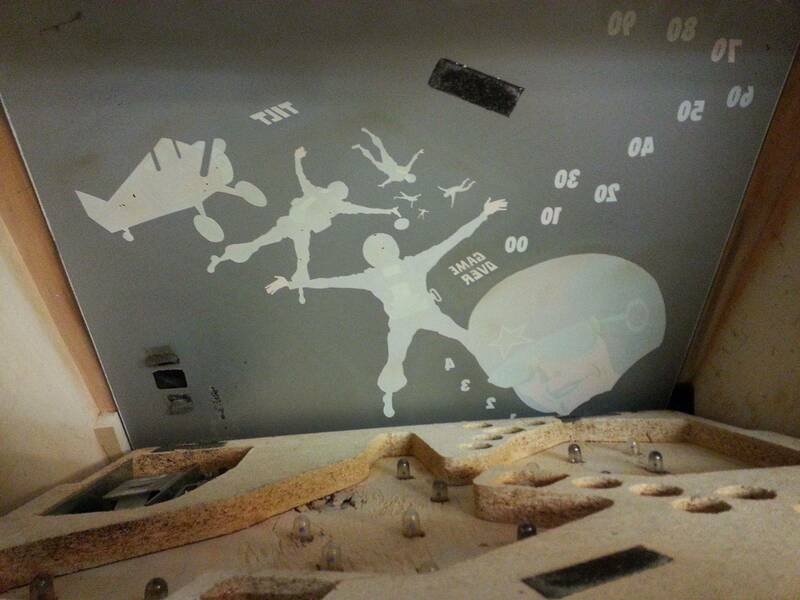 I've had multiple Sky Jumps, all had webbing.Freefall had spatter. Game has been sold. It's now sitting in my garage. Please let me know if the sale falls through.